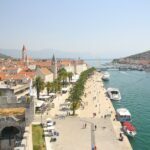 Trogir – it sounds like a Tolkien’s Lord of the Rings town, or a planet from Star Wars or even a strange creature featured in Harry Potter! 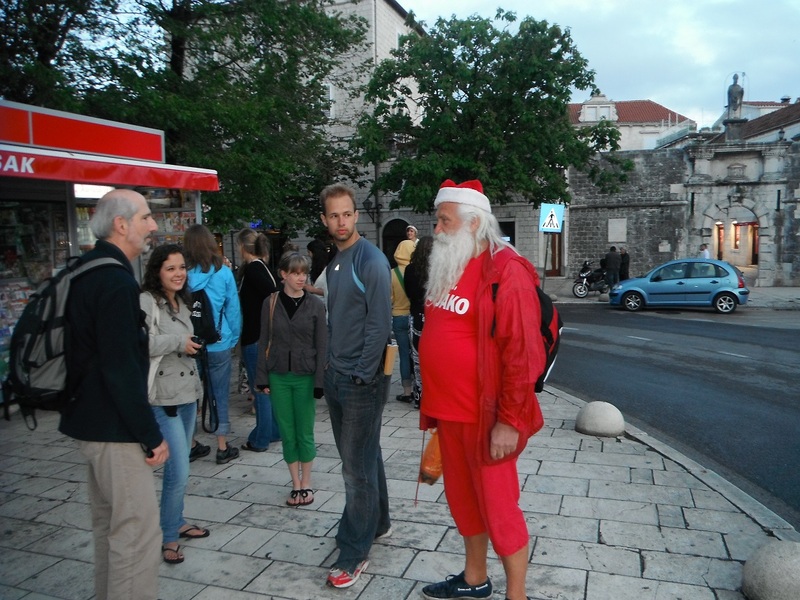 It is in fact a town in Croatia and on a recent visit I bumped into Father Christmas on his summer vacation. 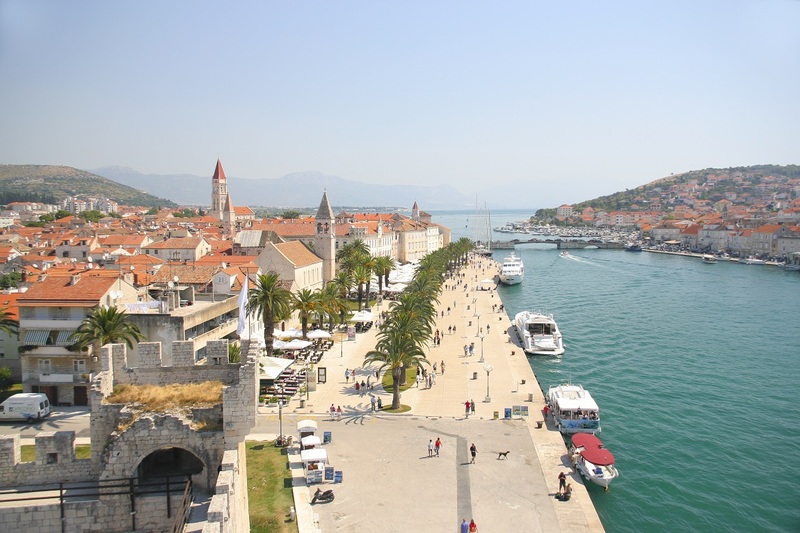 A very old town packed full of history Trogir dates from its very earliest to 2000 B.C. when the Greeks founded a settlement called Tragurion and then in the 1st Century B.C. the Romans came along and called it Tragurium. Situated in the Dalmation region of Croatia Trogir sits on an Island in the Bay of Kastela strait between the Island of Ciova and the mainland and thus probably managed to avoid much of the strife and invasions over the years that affected the surrounding areas. It is very much this reason that its old historic buildings and character is retained and so much so that UNESCO recognised Trogir as a world heritage site in 1997. Of course Father Christmas will have seen many changes but the ancient buildings that remain are as old as and older than him. The Church of St Barbara dates from the 11th Century and in a building flurry in the 12th Century the Cathedral with its Portal created by Radovan the artisan and the city walls were all built. The castle and St Marks Tower were built to protect the town from the Turks in the 15th century along with a statement building, the Great Palace of Cipiko. All this and more makes for fascinating viewing as you walk round the town with its narrow streets and the sea always close. Father Christmas is not just on holiday for the cultural sights but as a holiday suggests this is the place to relax, switch off from his busy work and enjoy the Adriatic coastline with many cafes and bars to sit at and enjoy the views while sipping a luxurious expresso or cappuccino made by the coffee masters in Croatia. He enjoys a little lunch of freshly picked salad and at this time of the year cherries, on sale, that were on the tree the day before or even that morning. An afternoon stroll to look at the boats moored on the harbour wall while enjoying a creamy local ice cream. Then, watching his figure, dinner will be grilled fish caught that day with a great choice of local Orada, John Dory, Calamari and sweet delicious prawns accompanied by a glass or two of the excellent local wines, a Malvasia white or a Dingac red. There have also been sightings of Father Christmas in the nearby city of Split and the port town of Zadar. I cannot confirm this as I only saw and spoke to him in Trogir but one thing is certain Croatia is his country of choice for his holidays so I would book a holiday with us to Croatia as I don’t think you can get a better recommendation! Written by Linda Velcic Please feel free to share this post and don’t forget to like our facebook page and sign up to our newsletter to keep up to date with Explore Travel and Cruises.